Non CCSU Students register here. Must show student ID at check-in. 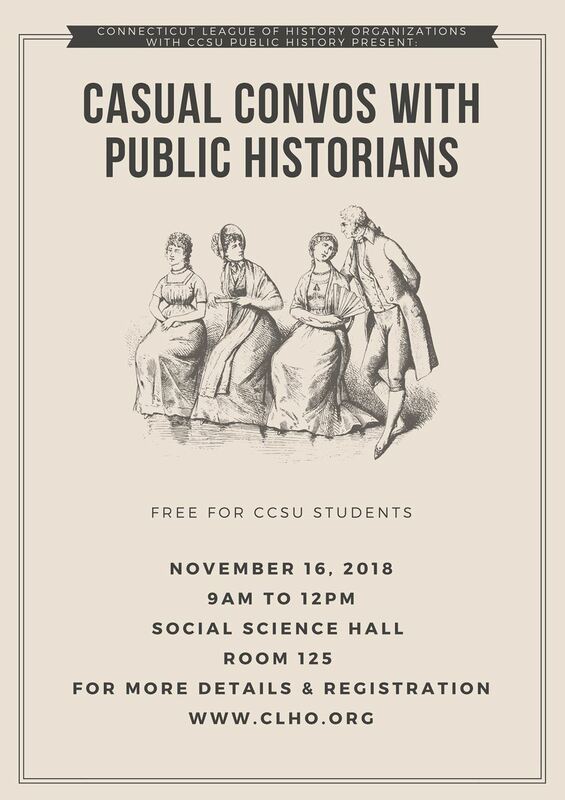 Connecticut League of History Organizations and CCSU Public History present Casual Convos with Public Historians, a career building workshop that will highlight the practical, non-conventional ways to be involved in the field of Public History. 9:00-10:00am Coffee and Chat: Light breakfast items and refreshments will be served during which time students can mingle with our guest speakers. 10:00-11:30am Telling the Tale: This will give speakers time to discuss their experiences juggling academics, family life and a career while also doing what they love. Speakers will highlight career paths with emphasis on specific projects, or portions of what their role entails i.e. collections management, employee management and hiring, volunteers etc. 11:30-12:00pm Casual Convo: We will open the discussion to the panel for questions. A short survey will be passed out at the beginning asking students what they thought worked, what didn’t and the feedback of the workshop for future ideas. To be collected on their way out.